Many of the first Apple Watch health IT apps will give doctors faster access to critical information and ease communication between health care providers, while other apps will attempt to get patients more engaged with their health. Don’t expect doctors to glance at their wrists to view X-rays or a patient’s chart, though. Given the Apple Watch’s screen size, functions that involve text messages work best on the device. “Doctors get that the watch is a tool to help them deal with information overload,” said Michael Nusimow, CEO of drchrono, which makes EHR (electronic health record) software. Like many other companies in the health space, drchrono announced its app this week at a large health IT conference put on by the Healthcare Information and Management Systems Society, a nonprofit that looks to use IT to improve medical care. 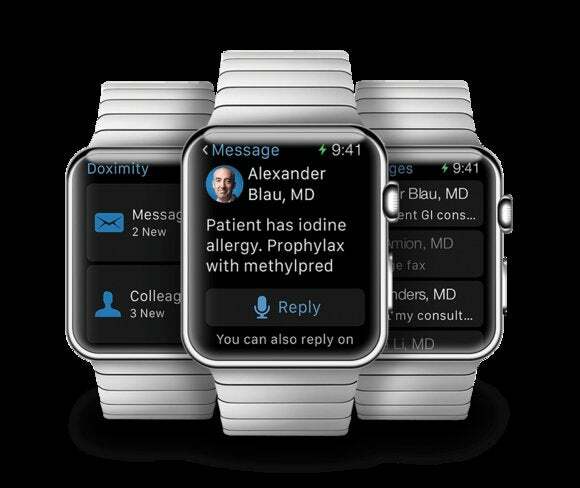 About a dozen companies in the health care industry announced their Apple Watch apps this week. EHRs can overwhelm a physician with troves of data on a patient, Nusimow said. With drchrono’s Apple Watch app, doctors can receive relevant and important information, such as when a patient arrives at the office. The app can also provide them with the patient’s vital statistics and pictures. The watch is better suited for tasks like getting text notifications, while the iPad and iPhone, which drchrono also has apps for, can handle functions that require bigger screens, like reviewing charts, Nusimow said. Watches are more socially acceptable than smartphones, making them ideal to handle messages and notifications, said Vik Kheterpal, principal at CareEvolution, which develops the technology behind health information exchanges. CareEvolution worked with health insurance provider Anthem to develop its Apple Watch app, which was announced this week. The app, called cFHR, is designed to provide Anthem customers with timely health information. The app, for example, will remind patients to check their blood pressure or alert them about possible medication interactions. While the iPhone can complete the same tasks as the Apple Watch, there’s a nuanced difference between the devices, Kheterpal said. People depend on smartphones to instantly convey information. But as the devices have become larger, people may find them a bit cumbersome to constantly remove from their bag or pocket. Plus, some aspects of smartphones, like the devices inopportunely ringing, are social taboos, he said. The Apple Watch, by comparison, is an extension of the phone, always on a person’s wrist and reliably delivers notifications, Kheterpal said. The Apple Watch won’t replace the iPhone, said Nate Gross, co-founder of Doximity, a startup that operates a social network for U.S. physicians. With its app, Doximity was looking to offload some functions to the watch, but save a majority of the tasks for the iPhone. “We focused on messaging because in the clinical setting, there are a number of times when you just don’t want to take out your phone to start texting,” said Gross. In some situations, doctors may find that speaking is a better option that typing, he said. For instance, they may prefer to dictate patient notes instead of type them into an iPhone. While an iPhone app can receive messages, doctors may not hear the phone or feel it vibrate if they place the device in their pocket or lab coat, said Gross. Doximity’s app, which was announced last week, allows physicians to view messages sent to them from other doctors who use the company’s social network and also to receive alerts when a fax arrives. In health care, “time is tissue” and delivering alerts to a person’s wrist may help a doctor view an urgent message more quickly, he said. Some physicians who work long hours may need to extend the Apple Watch’s 18-hour battery life to the get the most from their health IT apps, Gross added. Emergency room doctors and medical residents can work 24-hour shifts. Some may purchase third-party watch bands equipped with batteries while others will charge the device during their shifts, he said. “We will see friction occur on battery life for very specific doctors rather than doctors as a whole,” said Gross. Physicians aren’t accustomed to owning watches that require nightly charging, he added.